The music icon was found unresponsive in an elevator at his Chanhassen estate on 21 April (16), and he was subsequently pronounced dead at the age of 57. An autopsy was carried out last Friday (22Apr16), but no immediate cause of death was determined, with coroners claiming their decision was pending the results of further tests. 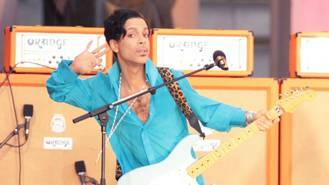 Reports suggest Prince, whose body was cremated on Saturday (23Apr16), may have been battling an issue with painkillers he was taking for a hip injury in the days before his passing. On Thursday morning (28Apr16), a judge in Carver County issued the sheriff's request for a search warrant, allowing them to re-enter Paisley Park, where they will allegedly look for evidence of drugs, prescriptions or other information which may help their case, according to TMZ.com. The judge also agreed to seal the documents detailing the reason for the search warrant for six months, or until the start of any criminal case, due to concerns of evidence tampering. Explaining their request to keep the information confidential, officials wrote, "Premature disclosure of the details provided in the search warrant and its accompanying documents may compromise this law enforcement investigation by causing the search or related searches to be unsuccessful." Meanwhile, Jason Kamerud, spokesman for the sheriff's office, has dismissed rumours suggesting agents from the Drug Enforcement Administration (DEA) have been called in to assist with the investigation into the superstar's death. "The DEA is not part of this investigation at this time," Kamerud tells The Hollywood Reporter. The latest developments in the police investigation emerge a day after another Minnesota judge confirmed Prince did not leave a will, and appointed executives at the Bremer Trust, National Association, to serve as the temporary administrators of the singer's estate, as per the request of the Kiss star's sister, Tyka Nelson. Meanwhile, Prince's former fiancee, drummer Sheila E., has shut down reports alleging she is at war with Tyka over the beneficiaries of the late legend's estate. Her representative insists Sheila, who flew to Minnesota last week to mourn with Prince's family and friends, is not fighting with Tyka and is simply offering her help to ensure no one exploits the musician's legacy following his death. The spokesperson goes on to declare Sheila "has received no compensation nor will accept compensation" for her advice, while she has also rejected multiple offers to cash in with her own tribute concerts.